Music lovers in the cities of Washington, Boston, Chicago, Ann Arbor, Palm Desert, San Diego, Santa Barbara, Rohnert Park and Berkeley have a treat in store. 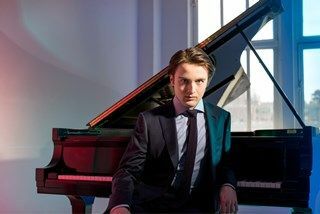 Beginning Monday, March 14 the Orchestre symphonique de Montréal (OSM) will showcase on their American tour the brilliant pianist Daniil Trifonov who will play Prokofiev’s Third Piano Concerto. (Maria João Pires will replace Trifonov in New York where he recently played the concerto with the Mariinsky Orchestra.) During the pre-tour concerts in Montreal this week, Trifonov on Tuesday evening gave a sensational performance. Winner of the first prize at both the Tchaikovsky and Rubinstein competitions in 2011, the 25-year old displayed supreme mastery of the work. After the smoothly-textured clarinet entry, Trifonov tore into the first theme with fiery brilliance, bringing clarity and gravitas to the pounding chords and impeccable tone and color to the rapid scale sequences. He played the quieter passages with liquid execution and an exquisite, silken touch. The second movement sparkled, as Trifonov brought out the myriad nuances of each of the five variations. He and the orchestra, playing seamlessly as equal partners (as the composer intended), gradually built up the cumulative tension in the final movement so that it exploded in a breathtaking climax. It was rare indeed to experience such a gripping, virtually flawless performance. As if one warhorse were not enough, Nagano and the orchestra closed the concert with Stravinsky’s The Rite of Spring. First performed in Montreal with Igor Markevitch in 1957, it went on to become one of the OSM’s signature works under the direction of Charles Dutoit. As the program notes state, the work represents “the confluence of Russian and French influences at the heart of the OSM’s traditional programming.” Of the current 88 orchestra members, 66 played during the Dutoit regime (1978-2002) and it was evident from Tuesday’s performance that this music is still embedded, so to speak, in the orchestra’s DNA. A difficult piece to conduct, with its dissonant harmonies and asymmetrical rhythms, Nagano navigated its treacherous shoals with close attention to the shifting tempos and unpredictable syncopations. It was an intense reading, characterized by tension in the explosive sections and a fine, although sometimes dry, lyricism in the slower passages. Nagano respected the work’s wide dynamic range (going as low as pppp) but at times the trumpets sounded raw and strident in the fff passages. (Principal trumpet Paul Merkelo, however, brought a haunting, mysterious quality to his muted lines in “The Mystic Circle of the Young Girls”.) The finely-honed strings drew deep luscious sounds; the eight horns played impeccably; and the numerous woodwind solos performed with clarity and panache. The concert opened with Debussy’s last orchestral composition—Jeux from 1912. (All three works on the program were written during a 10-year period.) Despite the whimsical opening, Nagano gave the piece a rather pedantic reading. The first half sometimes lacked color and was marked by timid rhythms. Concertmaster Andrew Wan’s solos, however, were earnest and moving, and the orchestra’s mounting intensity brought the performance to a thunderous conclusion.